Our fabulous sea side spot of Appley Beach and Park is host to the clash of the Pirate clans once again this year, with the 2016 Shipwreck Isle shivering its timbers on 18 and 19 June. We all love a bit of pirate-y fun at Goodleaf and are looking forward to hoisting the mainstays (well the ropes of our tree anyway!) and getting involved. Follow the Jolly Roger and join us for Shipwreck Isle – Swashbuckling Specials on Saturday 18th June. Tree climbing will start at 12 pm and all climbs are one hour long. We’ll be offering you the chance to hoist the mainsail (climb the rope) and walk the plank (walk out on a branch) in the Goodleaf tree for a special price of just 17.00 doubloons (£17 per person for the hour). Yo Ho Ho!! You can book online here or give us a call on 0333 800 1188. Pick up your Goodleaf mug – perfect for your grog/tot of rum/orange squash. We’re giving away a free camping mug to everyone who climbs with us at Shipwreck Isle. And, if you sign your name here, we’ll also be emailing you with an additional Goodleaf Special just for Shipwreck Isle. There’s loads on throughout the weekend and Shipwreck Isle will transport you to the Island back in the 18th century, when pirates ruled the waves and smugglers hid out in the caves of the West Wight. It’s the perfect excuse to get your tights out and dress up like Captain Jack Sparrow or Blackbeard himself – you never know you might find a pirate up the tree. This year will see lots of pirate fun on Saturday 18 and Sunday 19 June with a pop up cinema, pirate themed food stalls, games, music and plenty more on show. 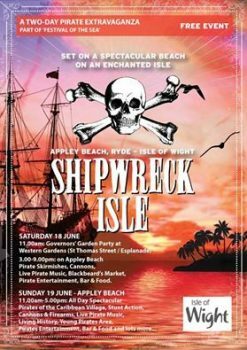 The programme is different each day so it’s worth popping down for the whole weekend to get the most out of Shipwreck Isle .You’ll even be able to take part in pirate themed games on the golden sands of Appley Beach. We’re super easy to get to from public transport. Why not come on foot (NB no further discounts apply for our Swashbuckling Special) and leave the car at home. Find out about Wightlink’s Shipwreck Isle offer. Plus loads more Pirate-y news on there! Hover over the sea to us with Hovertravel.